The tree cutting between Cemetery Ridge and the Taneytown Road is nearing completion. The William Patterson House is in the right background. This view was taken from the southwest facing northeast at approximately 5:00 PM on Friday, October 17, 2008. 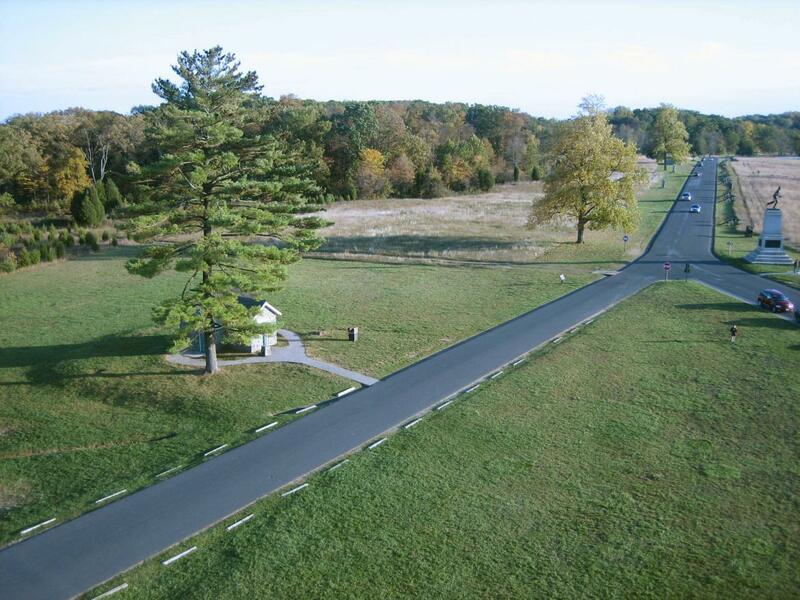 The Battlefield Rehabilitation (tree cutting) between the Taneytown Road and Cemetery Ridge opens up the William Patterson Farm to appear closer to the way that it looked at the time of the battle. 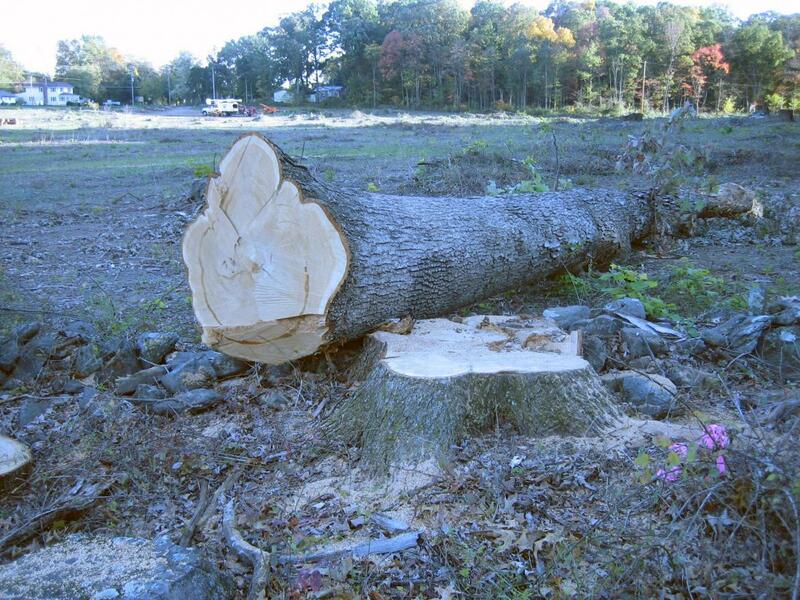 The trees have been cut down close to the National Park Service Maintenance area. 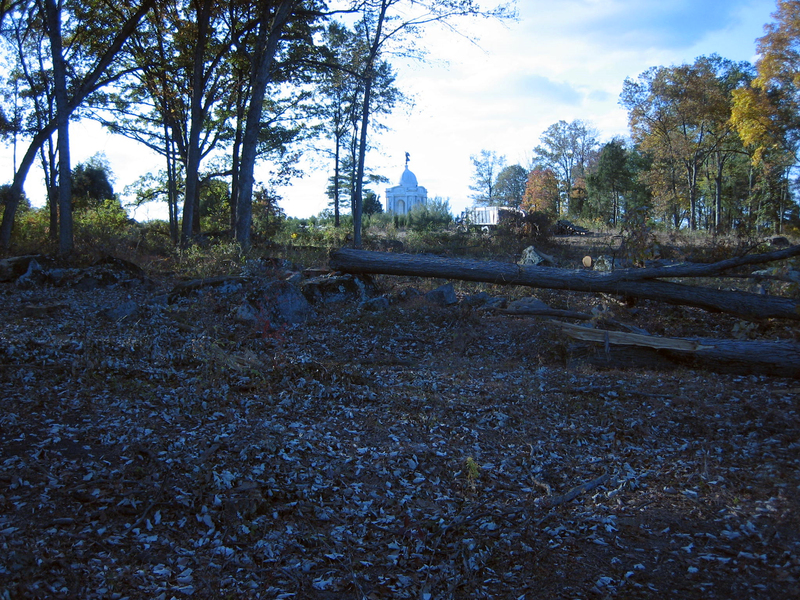 More tree cutting is occurring between the Patterson Farm and the Pennsylvania State Monument. “William Patterson House Stabilization” on August 11, 2008. 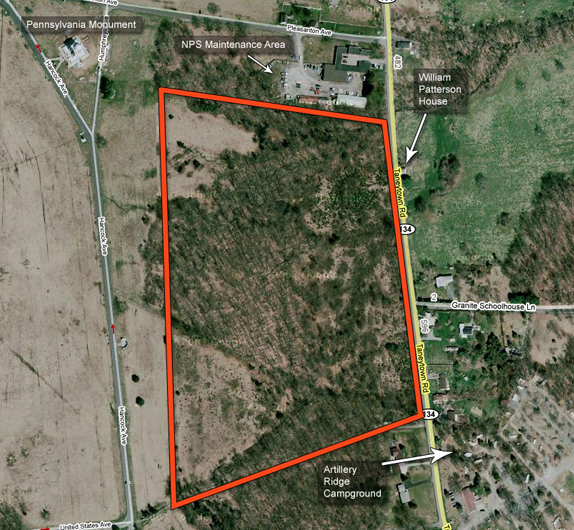 We have outlined in red the general area from which the trees have and are being removed. 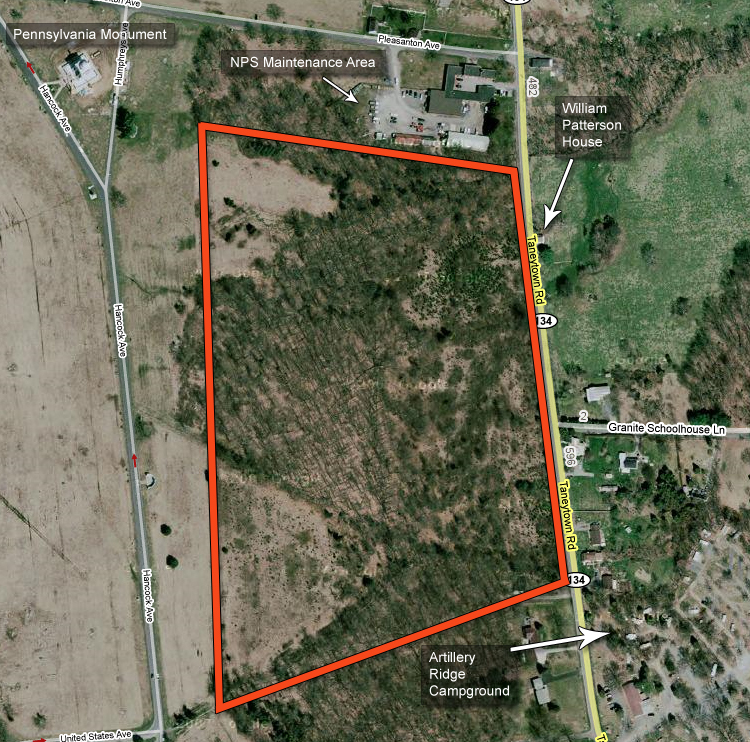 According to the map programs that we have, this area consists of just over 33 acres. The William Patterson House and the Taneytown Road are on the left. The treeline in the background begins at the horse trail from Artillery Ridge Campground. We are standing near the National Park Service Maintenance Area, which would be to our right or west. This view was taken from the north facing south at approximately 5:00 PM on Friday, October 17, 2008. 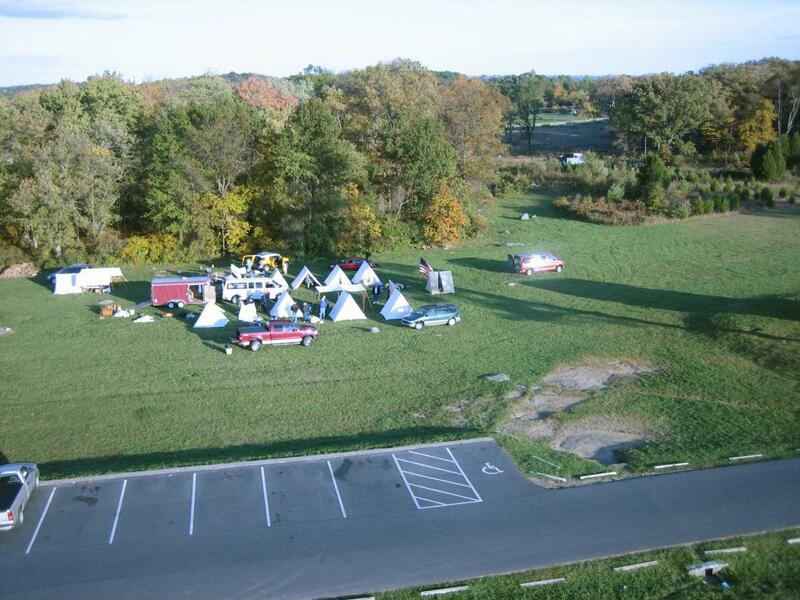 Here is part of the National Park Service Maintenance area. This view was taken from the northeast facing southwest at approximately 5:00 PM on Friday, October 17, 2008. 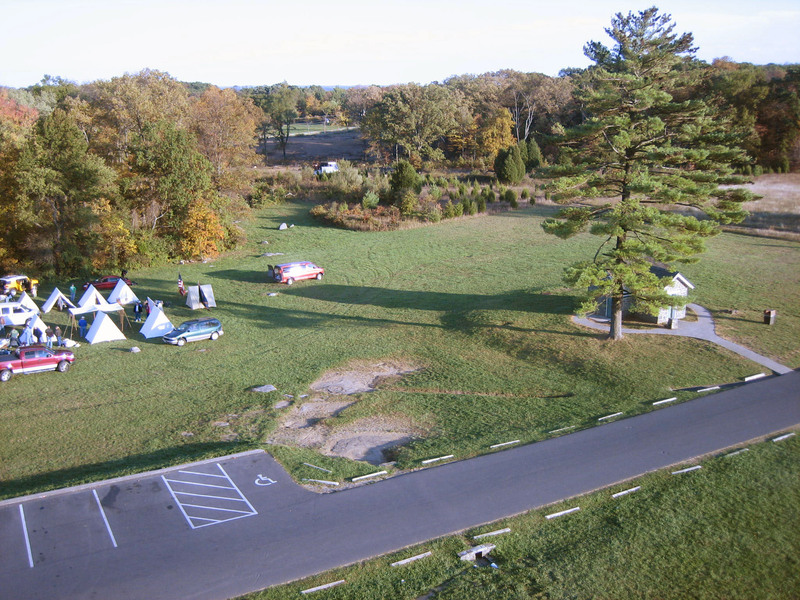 While some trees have been left as a screen, previous Park Service discussions have considered building a fence to hide the maintenance area now that the trees are gone. This view was taken from the southeast facing northwest at approximately 5:00 PM on Friday, October 17, 2008. 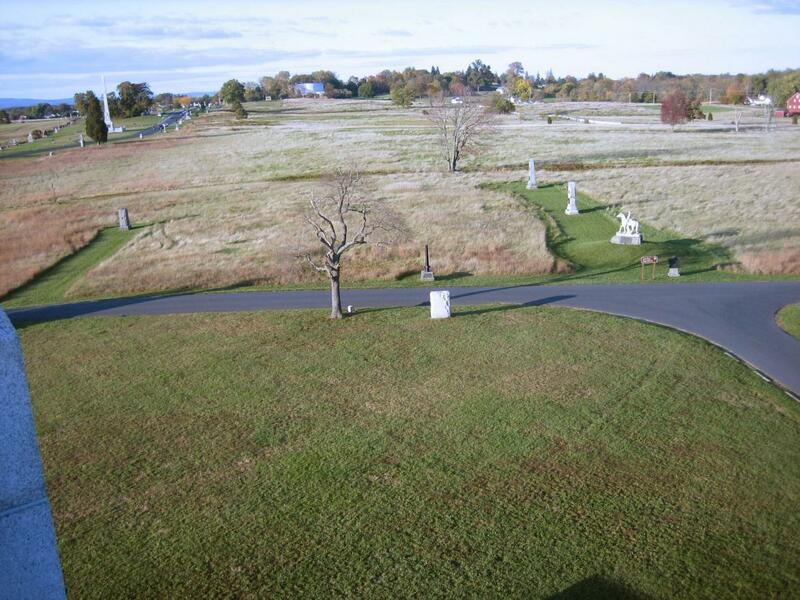 Here is the Patterson Farm area, taken from the trees remaining on the east side of Cemetery Ridge, looking to the east. The William Patterson House is in the background. This view was taken from the west facing east at approximately 5:00 PM on Friday, October 17, 2008. 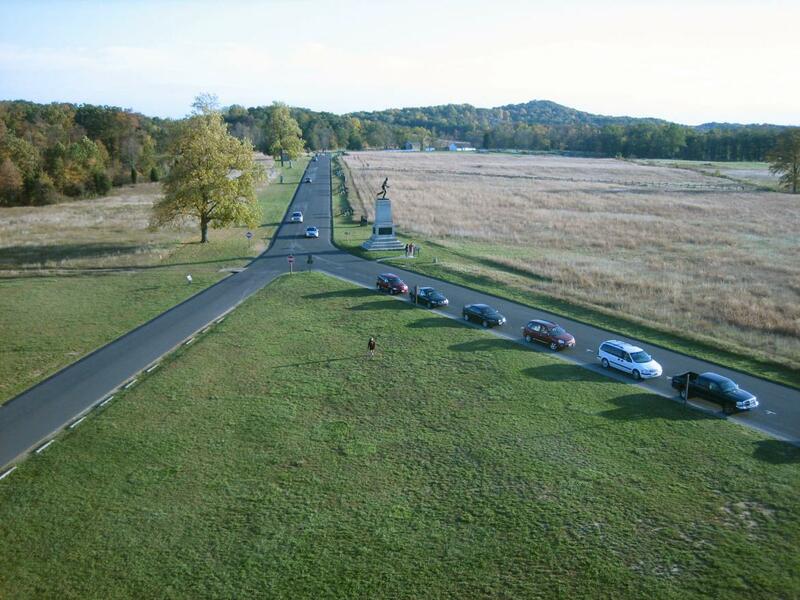 When one turns around at the spot of the previous picture, the Pennsylvania Monument on Cemetery Ridge is now clearly in the background. The trucks involved in the cutting down of more trees are shown below the Pennsylvania Monument. This view was taken from the southeast facing northwest at approximately 5:00 PM on Friday, October 17, 2008. Some of the trees that are still remaining look pretty big. This one is located at a stone wall running east to west in the middle of the field. This view was taken from the north facing south at approximately 5:00 PM on Friday, October 17, 2008. 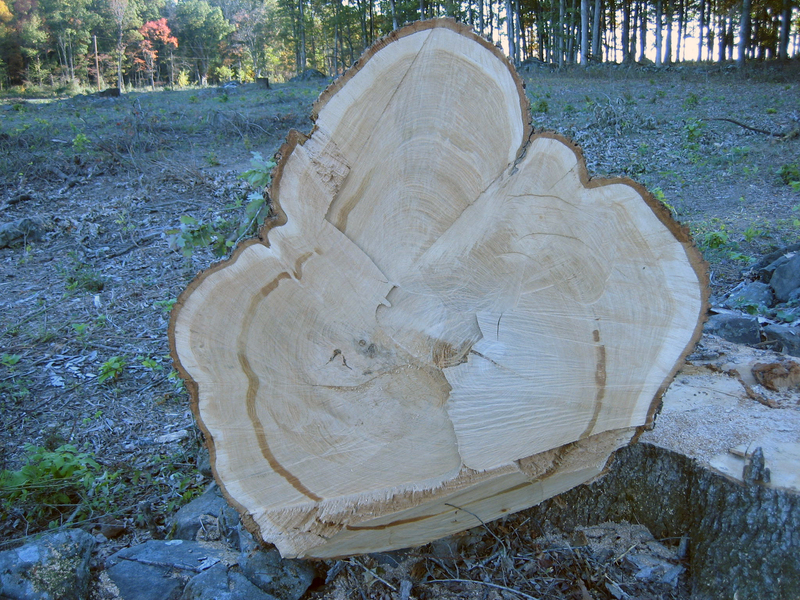 We don’t know how old this tree is (was), but anybody who wants to click on this photograph and count the rings can find out. 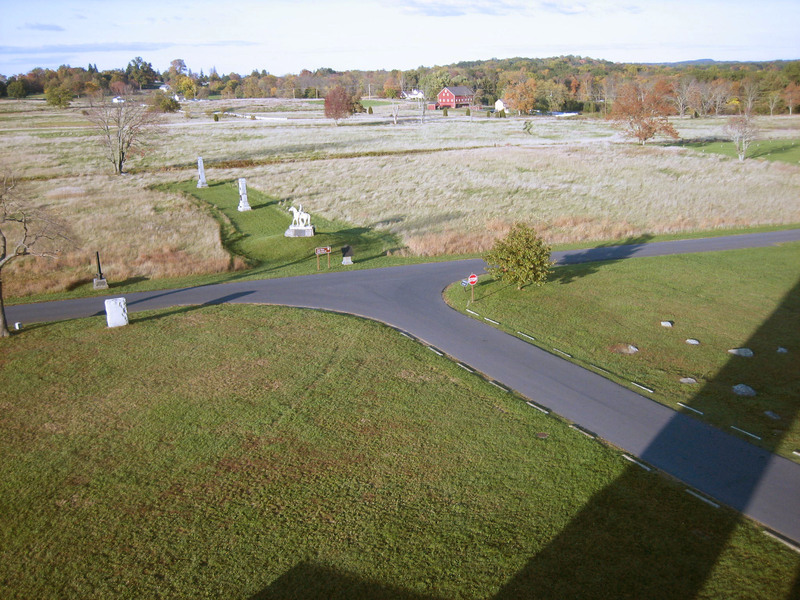 This view was taken from the north facing south at approximately 5:00 PM on Friday, October 17, 2008. 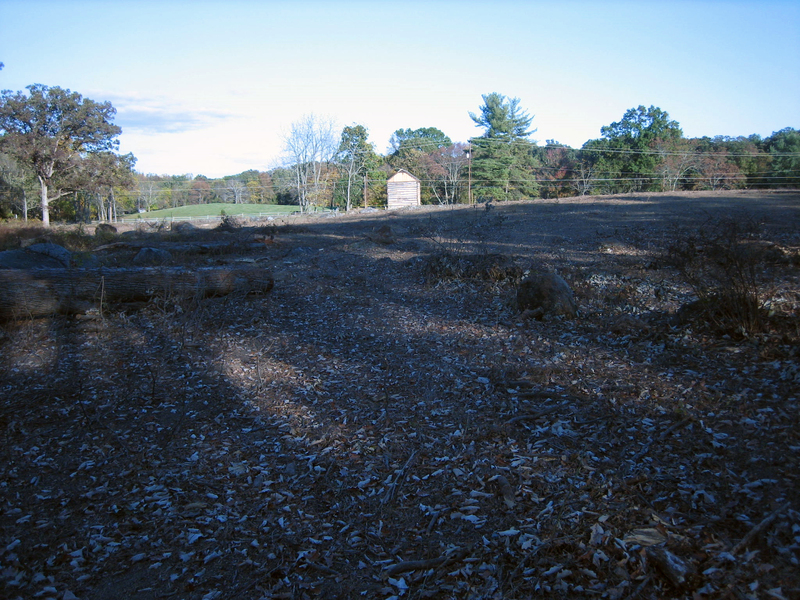 Here’s a view of the cleared area from the Pennsylvania Monument. Humphreys Avenue is in the foreground. 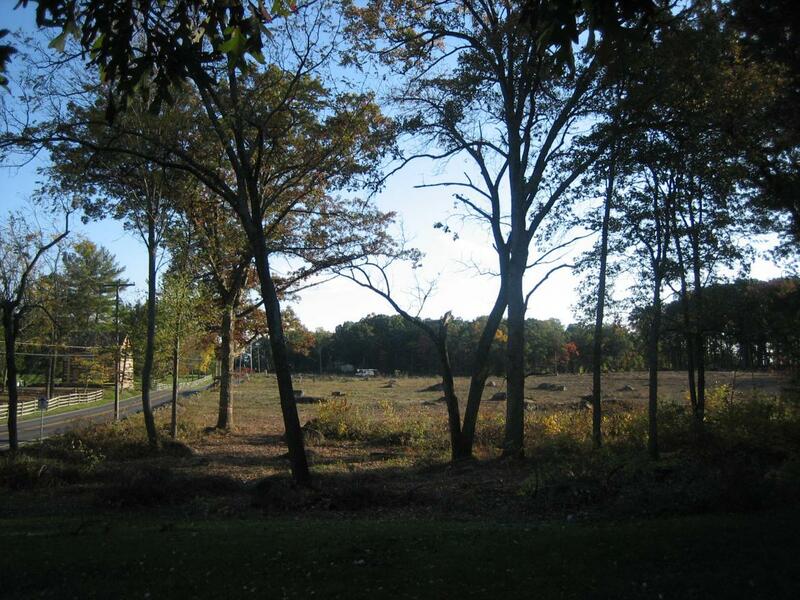 This view was taken from the northwest facing southeast at approximately 5:00 PM on Friday, October 17, 2008. For a medium-sized version of the panorama click here. For the larger JPEG version, click here. If you’d like to see the uncompressed TIFF file, you can download it here (35.5 MB). We will show this area from the top of the Pennsylvania Monument. We are standing on the southeast corner of the monument. To the left is the Copse (or Clump) of Trees at the High Water Mark area. 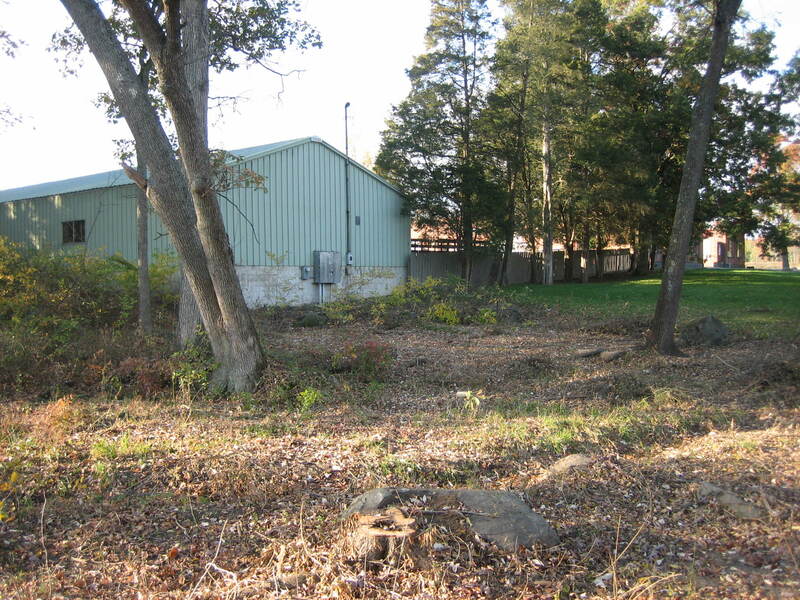 The Cyclorama Building is visible in Ziegler’s Grove. There is a large tree without leaves in the brown colored field. Above the tree is the small white Leister House (Meade’s Headquarters). Above the Leister House is Cemetery Hill. Pleasanton Avenue is running from right to left (east to west) in the foreground. Humphreys Avenue intersects it to the right of this picture. This view was taken from the south facing north at approximately 5:00 PM on Friday, October 17, 2008. Cemetery Hill is in the top left of this picture. 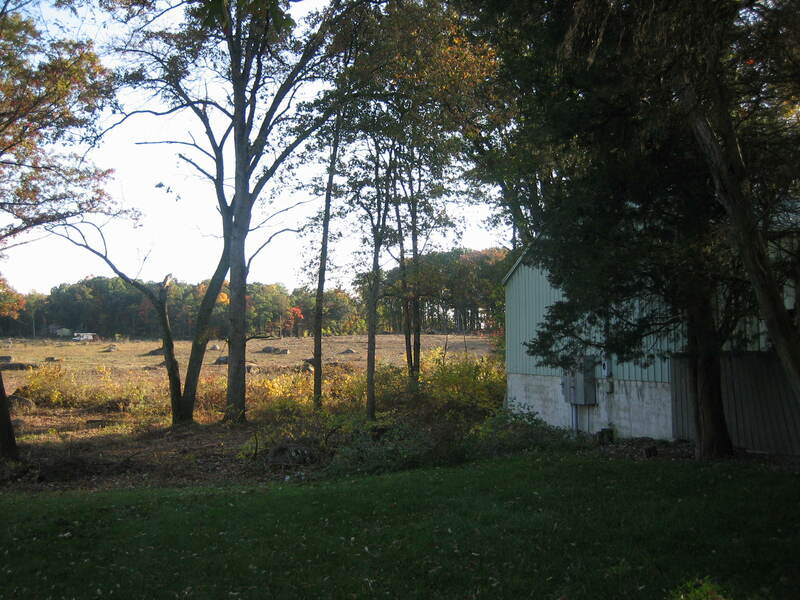 The red barn of the Peter Frey (later Basil Biggs) Farm is in the center background. Above the Frey Farm is Culp’s Hill. Humphreys Avenue is showing up from the bottom right of this photograph to intersect with Pleasanton Avenue at the stop sign. This view was taken from the southwest facing northeast at approximately 5:00 PM on Friday, October 17, 2008. The Peter Frey House and Culp’s Hill are in the left background. 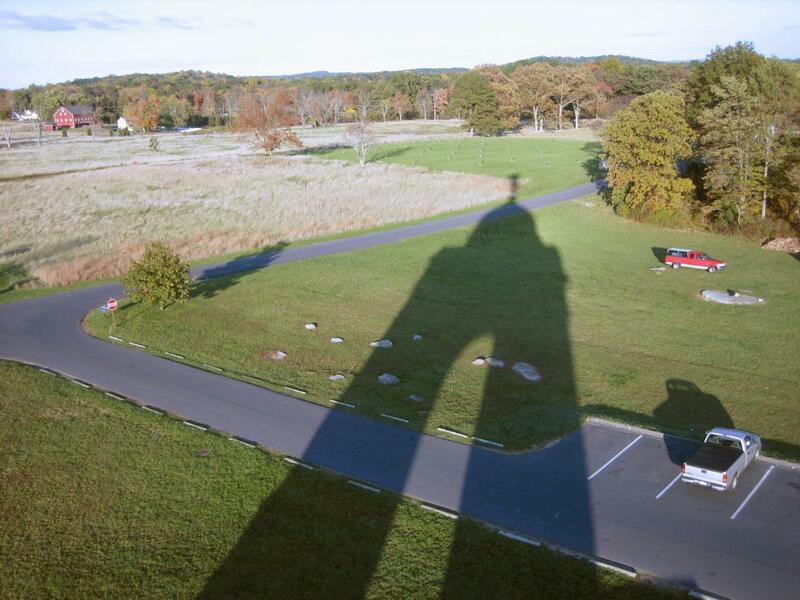 Wolf’s Hill is above the shadow of the Pennsylvania Monument. The parking lot on Humphreys Avenue is showing up in the bottom right of this photo. This view was taken from the west facing east at approximately 5:00 PM on Friday, October 17, 2008. Wolf’s Hill is in the left background. 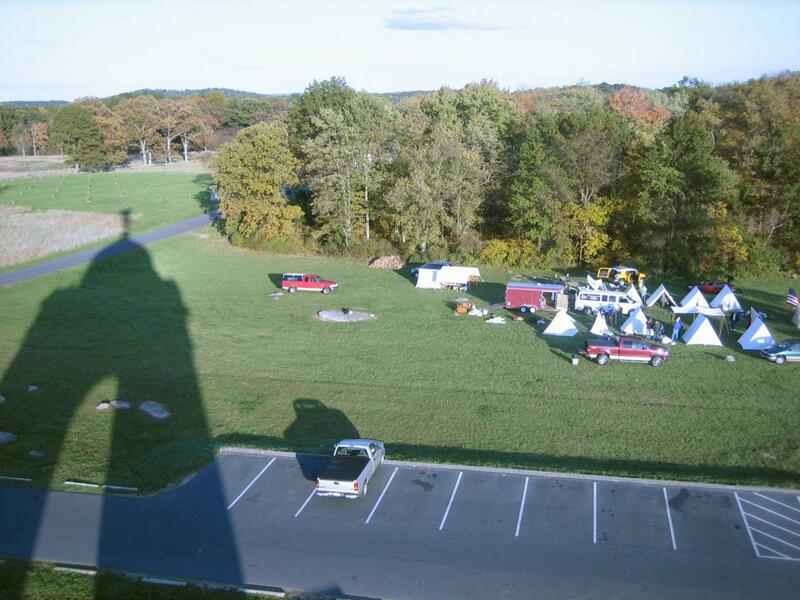 Members of the Ohio Valley Civil War Association are setting up camp for this weekend’s activities. This view was taken from the southwest facing northeast at approximately 5:00 PM on Friday, October 17, 2008. Above the red van with the reflection is the cleared area of the William Patterson Farm. This view was taken from the northwest facing southeast at approximately 5:00 PM on Friday, October 17, 2008. The tree cutting area is in the left background. The restroom is the small building at the foot of the tree in the right foreground. 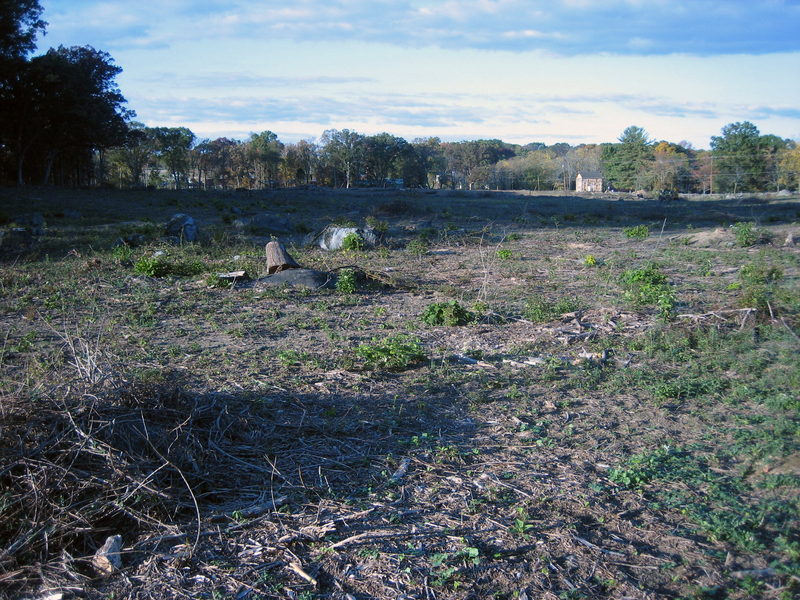 This view was taken from the northwest facing southeast at approximately 5:30 PM on Friday, October 17, 2008. The restroom is just west of Humphreys Avenue. Hancock Avenue intersects with Humphreys Avenue just to the left (east) of the 1st Minnesota Monument. 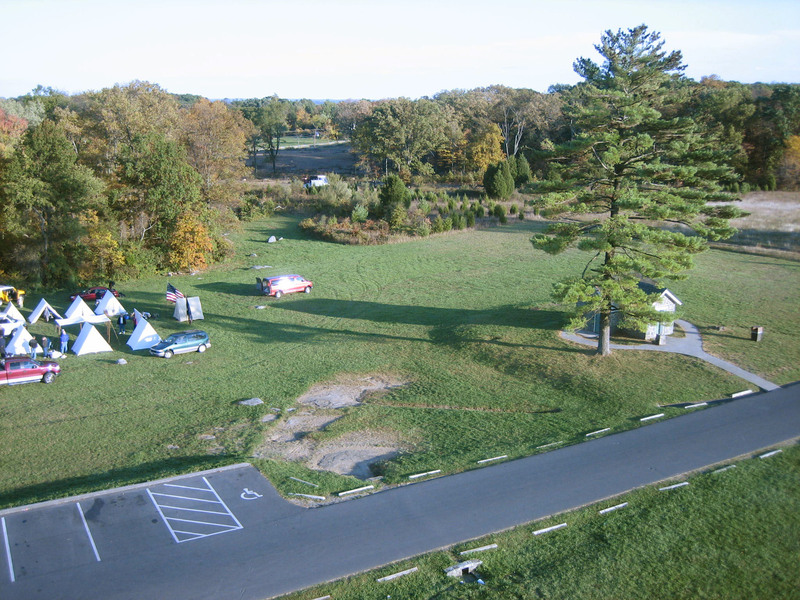 This view was taken from the northwest facing southeast at approximately 5:00 PM on Friday, October 17, 2008. The 1st Minnesota Monument is to the right (west) of the intersection of Hancock Avenue with Humphreys Avenue. The Round Tops are in the right background. This view was taken from the north facing south at approximately 5:00 PM on Friday, October 17, 2008.